We at Roof Repairs Only like to view roofs as a practical portion of building structures. The roof is designed to be the Protector of our family and possessions. Over the past 50 years the roof has become the “Evening Gown or Tuxedo of our Home”, an external showcase of our affluence. This is true in the residential market, but increasingly more so in retail and high end commercial structures. With the aesthetic importance of our roofs comes the complexity of the modern day roofing system. The complexity of which we speak is the flashing, the life blood of any roof system. Having soldered junctions in the flashing is critical. There is no adhesive, mastic, caulking or other space age sealant that can take the place of a soldered junction. Since 1989 doing roof repairs only, we have seen many high end roofing contractors refuse to solder their flashings, the most vulnerable points on a roof system. This business practice is incomprehensible to us. The lack of solder becomes irrelevant when the necessary flashing is not installed. This lack of necessary flashing is far more serious than the soldering epidemic, allow us to explain. It is not full lengths of flashing we find missing, instead, small areas that incorporate points on a roof that are vulnerable to directional winds. The lack of sufficient attention to detail in these seemingly remote, but extremely susceptible points on your roof, is where the greatest problem lies. 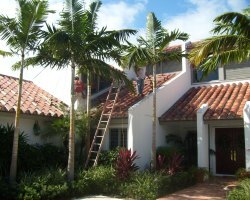 Many hard working, educated people, including some in building departments, believe the correct installation of flashing on a roof is left up to the integrity and reputation of the contractors on any given project. This belief needs to be dispelled. The best roof flashing jobs are accomplished when the building owner has taken the initiative to make themselves a fixture on the job site, daily if possible, to ask questions about anything of interest. The taking of pictures can help resolve future disputes, but it also sends out a message to the contractors that they are being watched.